SoftPlanet makes it possible for everyone to get free Panda Antivirus Pro download directly from our servers. There is no registration needed for downloading. There is big competition in the field of virus protection and Panda Antivirus Pro is one of the oldest participators. The app has a long tradition in this field, as it dates around year 1990 when developer Panda Security was established. Because of its long history the app surely knows how to protect your PC from various threats, but its capabilities are not based only on old experience, but also include new features, like the nice Panda Cloud Cleaner. But Panda Antivirus has a side, which is not so good, as it becomes paid after a 30-day trial period and the cheapest version for one PC costs USD 29.99. Panda Cloud Cleaner is one of the best attributes of Panda Antivirus Pro 13.01.01, because it is a cloud-based scan which cleans your computer with server-based software. In this way no virus or malware can intrude on the scanning process ensuring that you'll be safe all the time. For this operation the program downloads files from the server and then performs a remote scan, as on our PC it found 5 unknown files and suspicious policies and also cleaned the system from 44.86 MB of unneeded elements. But the other more standard functions also worked very well with the exception that Full Scan was very slow. Panda Antivirus Pro has a nice looking interface which makes the app look more and more like a Windows 8 program. The main screen gives you information about the level of your protection and tells you how many threats have been detected. You can start a scan of your system from there and when you choose that option it sends you to different scanning methods like Quick Scan, Full Scan, Custom Scan and Advanced Virus detection where Panda Cloud Cleaner is situated. On the main screen you can also view Reports from previous events and statistics. From there you can view your Quarantine and Improve your protection, which actually sends you to the website of the developer, where you can buy other protection programs if you liked Panda Antivirus. There are other important functions which can be activated in the main window of the app, which makes the interface not only good-looking but also user friendly. A good feature is that you can start different types of scans simultaneously, not wasting too much time with different operations. But when compared to other programs of its class the Full Scan of Panda Antivirus Pro is relatively slow as it took the app around 10 minutes to scan a hard disk of 14.6 GB. But this may be a good thing, because it means that the program does a thorough scan to the max of its capabilities, probably reaching the deepest places of your PC. In the mean time the Quick Scan is done in seconds, on the contrary to the Full Scan process. If we dismiss the slow Full Scan and that it is paid, Panda Antivirus Pro is a great protection program which can save you a lot of trouble. The Panda Cloud Cleaner is an awesome option, which launches the app to a new era and makes it much better, because you can scan your computer from a remote server, searching for a problem without the need to restart, which usually ensures that no virus intrusion has taken place during the scanning process. 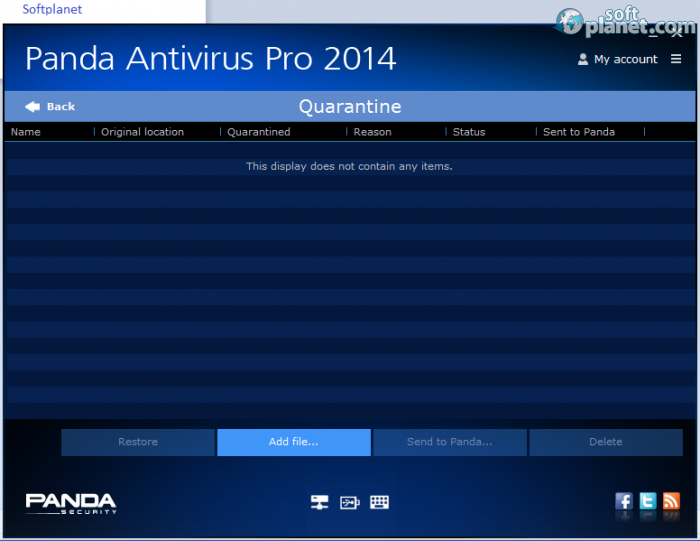 Panda Antivirus Pro is VIRUS-FREE! 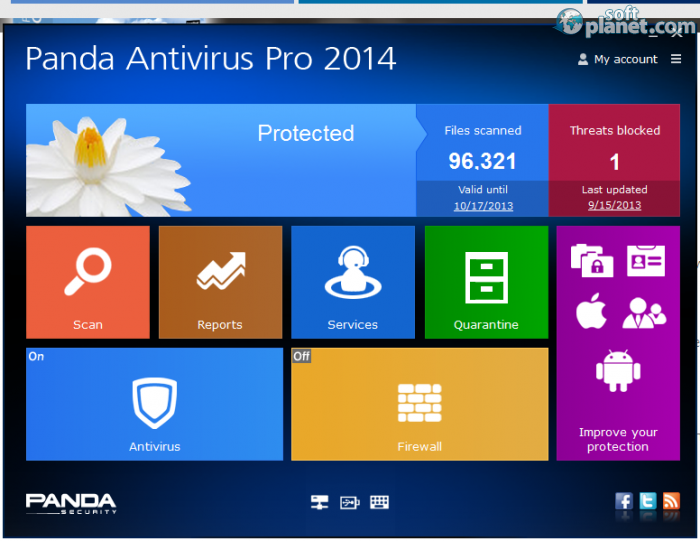 Our security scan shows that Panda Antivirus Pro is clean from viruses. The current version of Panda Antivirus Pro has been scanned by our system, which contains 46 different anti-virus algorithms. That ensures that Panda Antivirus Pro 15.01.00.0002 is 100% safe for your computer.